The recent passage of the budget bill has sparked public fury, as it included a plan to increase the annual salaries of lawmakers, while the budget for job creation was reduced. The ruling Democratic Party of Korea and the main opposition Liberty Korea Party on Saturday approved the 2019 budget bill of 469.6 trillion won ($416 billion), which included the plan to increase their wages by 1.8 percent. The three minor parties 00 the center-right Bareunmirae Party, center-left opposition Party for Democracy and Peace and progressive Justice Party -- boycotted the vote amid a row over electoral reform. On the presidential e-petition website, several petitions were made to demand that lawmakers “stop raising their own salaries.” As of Monday afternoon, one of the petitions had obtained 163,500 signatures, while another received 66,488 signatures. In light of criticism, the National Assembly Secretariat, the administration body, explained the pay raise is less than the average pay increase rate of ministers and vice ministers. Under the budget plan, the annual wage of a lawmaker is expected to go up from about 100.3 million won to 100.5 million won. 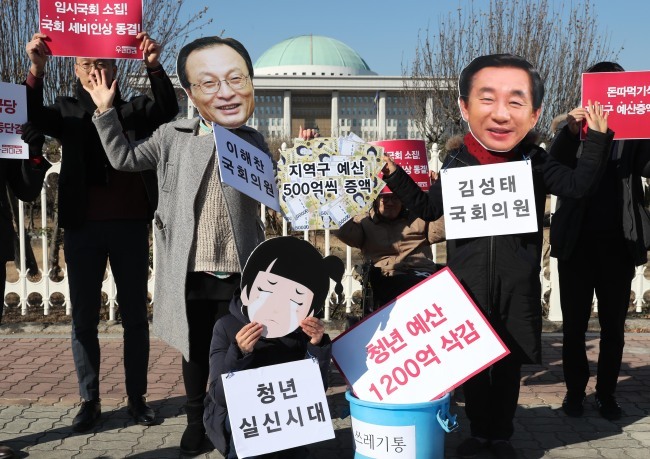 Adding the extra bonus of 47 million won for their performance, a lawmaker is expected to receive an annual salary of 151.7 million won next year. Lawmakers from the three minor parties that did not take part in the plenary session announced they would not take the expected wage increase. Some said they would donate the money. They also criticized the ruling and main opposition parties for passing the budget bill without their approval.